New Avocados for the Valley? The recent outbreak of the plant bacterium Xylella fastidiosa in southern Italy illustrates the potential for introduced organisms to incite widespread havoc in a short time. 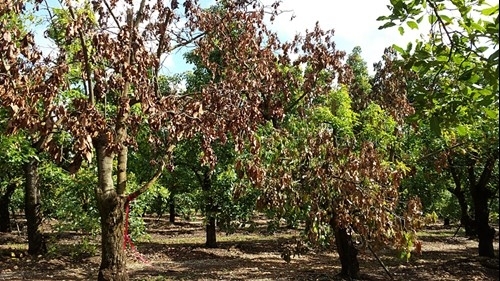 Xylella fastidiosa has been found in association with a new disease called olive quick decline syndrome (OQDS), which is affecting over 20,000 acres of olive in the Apulia region of Italy. Symptoms of OQDS include extensive branch and twig dieback, yellow and brown lesions on leaf tips and margins, vascular discoloration, and subsequent tree mortality. In southern Italy, the main insect vector of X. fastidiosa is the spittlebug Philaenus spumarius, which is known to occur in California. While research is underway to determine if the bacterium is responsible for causing OQDS, establishment of X. fastidiosa in Europe leaves growers and researchers asking where it came from. Genetic techniques used to compare pathogen populations have led researchers to hypothesize that the isolates of X. fastidiosa (strain CoDiRO) associated with OQDS, may have originated in Costa Rica. Marking the first European find of X. fastidiosa outside of Italy, the bacterium also was found on ornamental coffee plants at a retail market near Paris in April 2015; the plants had been imported to Europe from Honduras (3). In July 2015, X. fastidiosa was identified on ornamental plants on the French island of Corsica and on the mainland in October 2015 (2). The X. fastidiosa subspecies found in Corsica (subspecies multiplex) is different from that associated with OQDS in Italy (subspecies pauca) (2). The new introductions of X. fastidiosa to Europe illustrate the potential for long distance dispersal of the bacterium and a vulnerability of California agriculture to invasion by new organisms. The United States Department of Agriculture-Animal and Plant Health Inspection Service-Plant Protection and Quarantine's (USDA-APHIS-PPQ) New Pest Advisory Group (NPAG) is assessing the biology and potential economic and environmental impacts that the strain CoDiRO may pose to the United States to recommend potential regulatory strategies (Tara Holz, personal communication). 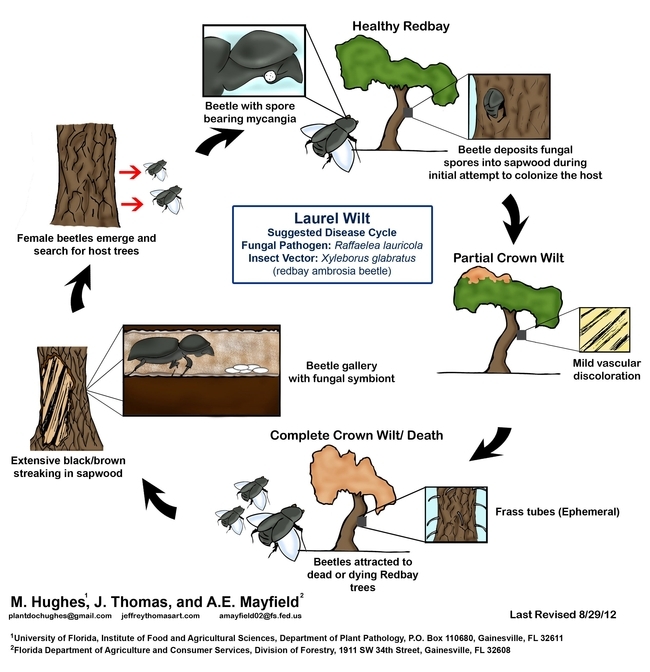 NPAG is designed to inform Federal decision makers regarding potential regulatory actions that may be appropriate to prevent pest introduction.Previous USDA-led research has found X. fastidiosa in California olive trees, but the endemic bacterium has only limited association with disease and is a different subspecies than the CoRiDO strain associated with the OQDS in Italy. California olive growers and industry stakeholders are encouraged to contact UCCE Farm Advisors to report trees displaying symptoms of OQDS. 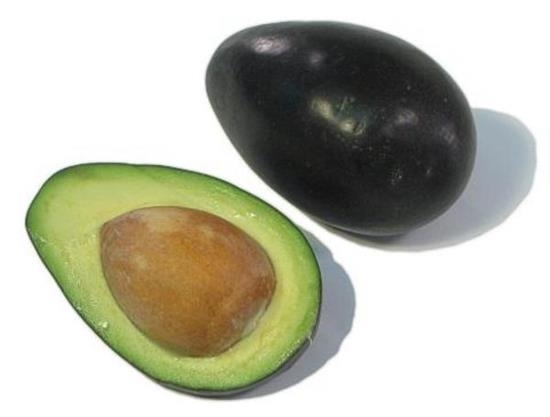 Avocado is a fruit tree that is notable for its sensitivity to cold. There are tropical varieities that are very sensitive to cold most notably many of the varieties that are of a West Indian origin. The subtropical varieites that are grown in California are of Mexican and Guatemalan origin or hybrids of these two subraces. ‘Hass' is a variety that has genetic origins of both of these subraces. Mexican origin typically have more cold tolerance than Guatemalan sources. Mexicans can often sustain cold down to the mid-20 deg F for a few hours when trees are mature. Young trees can sustain short periods under 30 deg but can be severely damaged or killed for prolonged times (more than 2 hours). Temperature and duration are not the only factors for determining damage potential. Humidity, wind and surrounding environments (proximity to open water, enclosed areas with reflective heat, etc.) are also important factors. We know from experience that some varieites of Mexican origin are more cold tolerant than other varieites, some being able to the very low 20's for prolonged periods are survive. They may not produce fruit the following year because all the fruiting wood may be killed, but they will still come back. Varieties like ‘Bacon, ‘Zutano', ‘Stewart', ‘Susan' and even ‘Fuerte' are notable for their greater cold tolerance than ‘Hass'. They may not have the same eating and shipping qualities as ‘Hass' so they will not be commercialized on the scale that ‘Hass' has. But some people like these lower oil content fruit. It recently came to my attention that there are some low chill avocado varieties that were selected in Texas where winter temperatures are usually killing for most of the avocado varieites we have have. 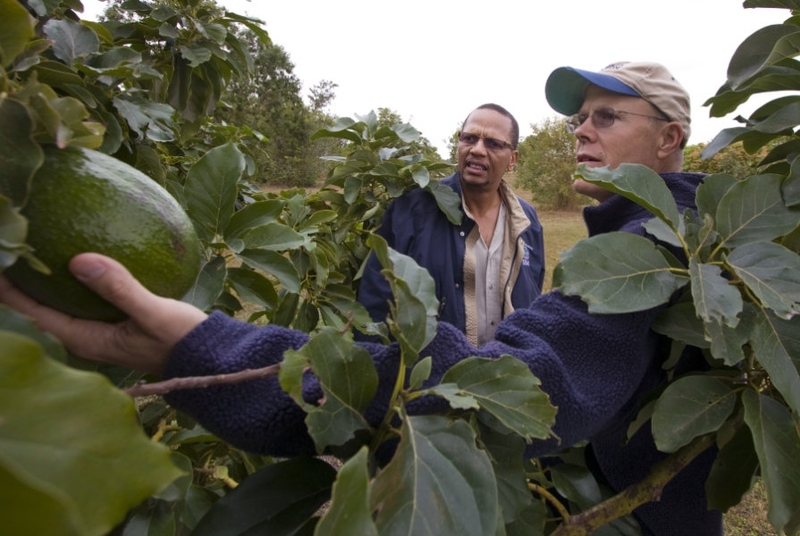 Texas has a much smaller acreage of avocados than California and even Hawaii. So small (under 500 acres) that yields are not recorded for this crop. Most of the trees are backyard trees that have much more protected environments than a normal orchard setting. No really systematic data has been collected on their cold tolerance, but word-of-mouth has identified several varieties that might be cold tolerant. These are ‘Holland', 'Wilma', ‘Joey, ‘Fantastic', ‘Lila' and ‘Poncho'. They may not be the best tasting (that is in the opinion of the taster, as always), the best shipping (thin skinned and damage easily), or hang on the tree for a long period of time, but may make for a good backyard tree in colder environments. 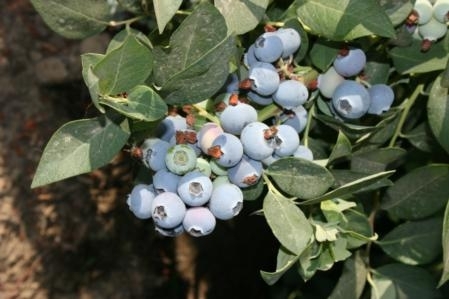 There has been no systematic study to determine if and which of these varieties might be more cold tolerant that those that we already are growing in California. Desperate gardeners might find them worth growing in marginal environments. The avocado as an evergreen subtropical will never likely be a commercial tree in Canada (greenhouses?) but there may be more cold tolerance in the species than we normally associate with the crop. 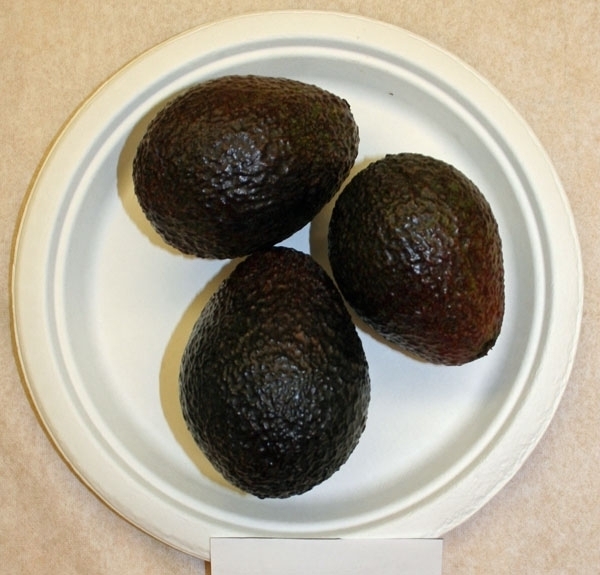 For a description of some of the characteristics of the Texas industry see the bulletin: http://aggie-horticulture.tamu.edu/fruit-nut/files/2015/04/avocados_2015.pdf .